We’d love your help. 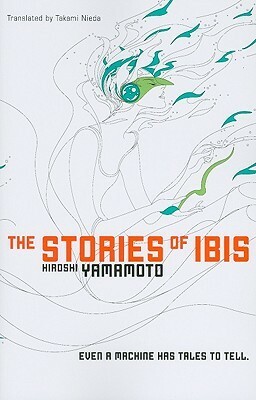 Let us know what’s wrong with this preview of The Stories of Ibis by Hiroshi Yamamoto. In a world where humans are a minority and androids have created their own civilization, a wandering storyteller meets the beautiful android Ibis. She tells him seven stories of human/android interaction in order to reveal the secret behind humanity's fall. The story takes place centuries in the future, where the diminished populations of humans live uncultured lives in th In a world where humans are a minority and androids have created their own civilization, a wandering storyteller meets the beautiful android Ibis. She tells him seven stories of human/android interaction in order to reveal the secret behind humanity's fall. The story takes place centuries in the future, where the diminished populations of humans live uncultured lives in their own colonies. They resent the androids, who have built themselves a stable and cultural society. In this brutal time, our main character travels from colony to colony as a “storyteller,” one that speaks of the stories of the past. One day, he is abducted by Ibis, an android in the form of a young girl, and told of the stories created by humans in the ancient past. To ask other readers questions about The Stories of Ibis, please sign up. Does anybody have the Phoebus declaration from the book in its full form? Essentially, this is a short story collection framed by another story to make it cohesive, a novel of surprising power. This is a world where humans have become the minority and machines rule it. There is great fear and anger carried by the humans and they hate the machines, who've become to advanced as to appear human, to act human. The novel's narrated by a storyteller. He travels between colonies to tell stories, to share movies, as the human world is a much smaller place, sort of stuck in the Essentially, this is a short story collection framed by another story to make it cohesive, a novel of surprising power. The novel's narrated by a storyteller. He travels between colonies to tell stories, to share movies, as the human world is a much smaller place, sort of stuck in the end of the 20th century, technologically. Quickly he encounters Ibis, an android, whom he tries to fight. He loses, is injured, and she takes him to a machine city, for lack of a better word. There we discover her intentions: She wants to tell him stories. And so she does. She tells him only stories that are fiction, which we disappear into--leaving Ibis and the narrator behind--and then, after the story is finished, we go back to our distrustful narrator. This process repeats until we come to the only nonfiction story: The story of Ibis' life. It's hard to judge the writing here, because it may be a translation problem more than a problem of the author. But the actual writing is simply okay. It's not prose that's going to impress you or leave you begging for more, but the stories are quite good. And, more than the individual stories that make up the novel, the shape of the novel is what makes this a worthy read. It's a powerful book, really, about the nature of truth, of language, but, mostly, it's about the power of stories. How stories can heal us, can save us, will change us. They are stories about the future [though, within the novel, they're the distant past] that reflect so clearly what life is now. It is a book about peace, about the beauty of differences. It is not about tolerating those who are different, but accepting them. Android, robots, AI, or whathaveyou stand in for every minority group to great effect, but they also stand in for themselves, and the fear and distrust many humans carry for the progression of technology. They speak of our fears, of the fears that lead to tragedies, to racism, to unspeakable evils, and give, in simple and clear terms, the absurdity of these fears. That the other needn't be an aggressor, but may just be another sentience wishing to live, to help others live. Hiroshi Yamamoto has come up with a clever framing device for compiling several of his short stories into a novel, presenting them as stories one character reads to another. He quickly acknowledges that this is not an original gimmick, name-checking "1,001 Arabian Nights" right away, but it allows him to connect five stories that are otherwise only related in theme, add in a longer story that nudges us toward the big revelations, and then hit us with the sort of post-human characters who can oft Hiroshi Yamamoto has come up with a clever framing device for compiling several of his short stories into a novel, presenting them as stories one character reads to another. He quickly acknowledges that this is not an original gimmick, name-checking "1,001 Arabian Nights" right away, but it allows him to connect five stories that are otherwise only related in theme, add in a longer story that nudges us toward the big revelations, and then hit us with the sort of post-human characters who can often come across as deliberately confusing , except that we've been well-prepared for the concepts. The individual stories are very good; they occasionally play on very familiar sci-fi (and sci-fi fandom) archetypes, but are well-executed examples of those ideas. Yamamoto is a shameless but effective borrower; in addition to Scheherazade, he also makes use of Asimov's famed Laws of Robotics, updating them for current ideas about artificial intelligence. The end result is a novel that is very much about ideas, more so than plot and, at times, more so than characterization, but does an excellent job of walking the fine line between dry exposition and frantic future shock. More so than the other novels I've read in Viz's Haikasoru line, this one seemed to come from a specifically Japanese perspective. In the second half, especially, there are pointed references made to the present and coming crises of population and demographics in Japan (and, likely, other prosperous first-world countries), and while Western post-cyberpunk sci-fi certainly embraces the idea of machine intelligences, it feels very natural coming from a culture that has historically believed that everything in nature (and even many man-made things) has a spirit. Yamamoto doesn't use that as a crutch, though - indeed, as much as he gives his machines a (literally) complex emotional range, he also makes it very clear that their nobility is a combination between cold logic and a design based to an extent on servitude. The Stories of Ibis offers a sparkling, fresh stance on man vs. machine science fiction, proving that the lines between both camps are not so simple to discern. Quite enjoyed the more heady philosophical debates on the role of machines in human lives and vice versa, how both parties rely on one another for companionship, purpose, and evolution. In particular, the idea of death as discussed between the nameless Storyteller and the android Ibis is a compelling one that will linger long after the b The Stories of Ibis offers a sparkling, fresh stance on man vs. machine science fiction, proving that the lines between both camps are not so simple to discern. Quite enjoyed the more heady philosophical debates on the role of machines in human lives and vice versa, how both parties rely on one another for companionship, purpose, and evolution. In particular, the idea of death as discussed between the nameless Storyteller and the android Ibis is a compelling one that will linger long after the book is closed. Also, loved how vital the act of storytelling is to this novel. Hiroshi Yamamoto places the writer in a central role as the preserver of human culture and as the bonding link between disparate civilizations. Meta-narrative at its most sci fi - delicious. Some readers might be turned off by the dense technical writing that accompanies a couple of the short stories. Remember: this is science fiction. Science is a large part of said fiction. Understanding the physics behind the fiction is vital at times andYamamoto explores it with great depth. I picked up this book in the library, having never heard of the title or the author, and was immediately captured by its clear prose and lucid imagery. Yamamoto does a superb job of transporting the reader into a gorgeously sensual future world. There are seven stories. Some of them are somewhat childish and nearly caused me to stop reading, but I'm immensely glad I stuck with the book. At its best, Stories of Ibis contains vivid, sophisticated speculations about the future and I have never read I picked up this book in the library, having never heard of the title or the author, and was immediately captured by its clear prose and lucid imagery. Yamamoto does a superb job of transporting the reader into a gorgeously sensual future world. There are seven stories. Some of them are somewhat childish and nearly caused me to stop reading, but I'm immensely glad I stuck with the book. At its best, Stories of Ibis contains vivid, sophisticated speculations about the future and I have never read a more convincing and detailed portrayal of what AI life might be like. The Day Shion Came y Ai Story resonaron aun más, lloré en partes en las que antes no lo había hecho y me maravillé descubriendo nuevos detalles que antes no había notado, sigue siendo el favorito sin duda. Un libro del que no esperaba nada y resultó una belleza. Esos japoneses sí le saben. This book isn't fast-moving--one of the stories, for instance, is about an AI caregiver learning her job at a nursing home--but it is a tremendous book. Being written by a Japanese author and translated into English, I quite enjoyed the genuinely Japanese setting for the stories. The stories were thoughtful ruminations on the interrelations between humans and artificial intelligences in subtle details, including the nuance and shapes that might take. The book works against the stereotypical stor This book isn't fast-moving--one of the stories, for instance, is about an AI caregiver learning her job at a nursing home--but it is a tremendous book. Being written by a Japanese author and translated into English, I quite enjoyed the genuinely Japanese setting for the stories. The stories were thoughtful ruminations on the interrelations between humans and artificial intelligences in subtle details, including the nuance and shapes that might take. The book works against the stereotypical story of "robots trying to take over the world," and even suggests at one point that humans project that story upon AI because of their own aggressive, dominating nature. Several AI in the book make the argument that AI are too intelligent to live via conflict and to believe the fictions that would fund such violence. It's a bold challenge for us to move beyond our "gedoshields," our systems of confirmation bias in which we dismiss anything that challenges our worldview. Seven short stories framed within one larger narrative. Each on their own are amazingly well written and powerful but combined they follow the well known pattern of the whole being greater than the sum of it's parts. I loved each story and the overall story was fantastic. Both ideas, environment and characters were all described in loving detail which has easily made me decide this is one of the best books, of this type, I have read in a very long time. Empezó un poco flojo pero fue escalando de tono hasta que se convirtió en uno de mis libros favoritos. La manera en la que hila las historias me pareció excelente. Es curioso como un libro que habla en su mayoría de androides y de inteligencias artificiales puede hacerte reflexionar de una manera asombrosa acerca de la humanidad. For the first 75% this is basically a short story collection with a frame story. Some of the stories are good while others are just sweet. The last part of the book binds the stories and the frame together. Extremely interesting view of human-machine relationship integrated into several stories. A worthy collection of stories about robot-human relationships and virtual reality. Good science-fiction work which stories invite us to reflect about our human nature and the possibilities of the artificial intelligence. My favorite story was "The Day Shion Came". Have you ever felt like you could fall in love with a book? That is exactly what I felt like after reading The Stories of Ibis. So far, since starting my reviews of books, I have fallen for two other books. One being White Noise and the other is Kafka on the Shore. Though as much as I enjoyed and could relate to those two, I had this preternatural feeling that Stories of Ibis was written for me and only me. Yes, I realize that is not the case. Believe me when I say that I may be a tad absurd at ti Have you ever felt like you could fall in love with a book? That is exactly what I felt like after reading The Stories of Ibis. Yes, I realize that is not the case. Believe me when I say that I may be a tad absurd at times, but I am not a complete nutcase. A little background as to why I love this book: since I was a child, I have always been fascinated with robots, droids, and cyborgs. I remember playground debates about the fundamentals of such creations and their functions. On and on it went and my fascination retained throughout all of these years. Now, reading The Stories of Ibis not only reinforced the old love I have for Artificial Intelligence, but also allowed me to see it in a different light; one that is more positive and hopeful. Here we have a future in which the human population is dwindling. Machines of individual intelligence have populated the Earth and have taken to building colonies for themselves. The humans, however, have taken the inclination to become luddites and fear the robots. The humans have spread the notion that the robots enslave, torture, kill humans indiscriminately. Though, there is little evidence to support such. In fact, the Internet still exists, but the humans refuse to tap into it to collect information calling it all robot propaganda considering that all they express (in terms understandable to humans) is only the wish to please the humans, to help them as best as they can. The novel starts out with the Narrator being kidnapped/rescued by the robot Ibis. The Narrator is a human storyteller who goes from colony to colony to recite to illiterate humans the literature and histories that he has read. Because of this, he holds a high position among other humans. Ibis has recognized this about the narrator. She decides to use him as a means to tell her story: the story about the original relationship between human and machine, to assuage his prejudice if she can. Because the Narrator is a storyteller, Ibis uses the power of fiction to reveal to him her true intents. The novel goes deep into the philosophy of using fiction, genres, and literature to explain the truth of a situation. This being a science fiction novel makes it ideal to express this point. After all, a majority of good science fiction is used to express concern over human action (or the lack thereof) – it is not just an escape for nerds and something for all the popular kids to fear (there’s a story within the novel about this particular assumption). Short story by short story, Ibis reveals her intent to the Narrator and proves beyond a reasonable doubt that his prejudices are false. The best part here, though, is the philosophy as to why robot prejudice is expected from human even if they are completely illogical. In the end, it is all about dreams and love. The dreams are an infinite puzzle to be continuously solved and placed into practice by those that man once created. The love… it is both real and i2 = − 1. Nutshell review: Mr. Yamamoto has written an excellent collection of stories that looks forward and back at the poverty of discrimination. Using androids as a foil, the author asks us to reconsider the many ways in which we oppress based on exigencies such as skin color, gender, age, or anything else that most consider unchangeable. Like many before him, Grant Morrison, Bill Willingham, Warren Ellis, Mr. Yamamoto believes in the power of fiction to change the world. The book is structured in the Nutshell review: Mr. Yamamoto has written an excellent collection of stories that looks forward and back at the poverty of discrimination. Using androids as a foil, the author asks us to reconsider the many ways in which we oppress based on exigencies such as skin color, gender, age, or anything else that most consider unchangeable. 7 fantastic stories wrapped in an intriguing shell. I especially loved "Black Hole Diver" and "The Day Shion Came", both of which I think will stay with me for a very long time. There's no shortage of robo-apocalyptia fiction out there, but this one is easily one of the best and most satisfying takes on the subgenre. Probably the finest anthology of sci-fi AI stories I've ever had the absolute pleasure of reading. Gorgeously realized, and cleverly assembled, this book actively CHANGED what I thought about humans and AI interacting. Amazing. You OWE it to yourself to read this book. Very very interesting. Almost, Bladerunner-y (movie. not Do Androids Dream....) I liked it, but ultimately felt like I knew where the book was heading. Although, seeing how this is an English translation, I don't know what got lost. "Loài người không thể chịu đựng lẫn nhau. Đối với AI mà nói, khác biệt cá nhân đơn giản là điều tự nhiên. [...] Có những AI có thể 'tư duy nhanh' và có những AI không thể. Khi nói chuyện với nhau, chúng tôi chỉ đơn giản chỉnh lại tốc độ sao cho phù nhau với nhau. Và dĩ nhiên là chúng tôi có những kiểu suy nghĩ khác nhau - cái mà loài người vẫn hay gọi là sở thích và tính cách. [...] Chúng tôi chấp nhận sự khác biệt của nhau. Chúng chỉ là sự khác biệt, không hơn không kém. Nhưng loài người lại không như vậy. Đối với họ, tư duy chậm chạp là một nỗi hổ thẹn. Những người có trở ngại về mặt giác quan hay vật lý bị khinh rẻ. Loài người xem thường những kẻ không cùng đức tin với mình. Thậm chí khác biệt về màu da cũng gây ra sự căm ghét. Những chi tiết vốn dĩ không thành vấn đề với chúng tôi [những AI] lại trở thành đề tài khơi gợi mâu thuẫn giữa loài người." Đây là một quyển sách nói về AI - Trí thông minh nhân tạo, nhưng kì thực mà nói nó lại bàn nhiều về đạo đức loài người hơn là về AI. Thật ra chúng ta vốn là loài có những suy nghĩ vô lý, như những AI trong sách này nêu ra. Chúng ta chỉ đơn giản là không thể nhìn thấy được quan điểm của nhau. Ví dụ như mình thích nhân vật A vì nhân vật A luôn luôn hành động dựa theo tính toán kĩ lưỡng và không bao giờ gây ra sai lầm, nhưng bạn mình lại thích nhân vật B vì nhân vật B thiên về cảm tính, giàu cảm xúc. Bạn mình và mình nếu ngồi với nhau bàn về vấn đề này chắc chắn sẽ gây ra tranh cãi, đơn giản là trải nghiệm hạn hẹp của hai đứa không cho phép sự thấu hiểu về quan điểm của nhau. Mình không phải là nó, mình chưa bao giờ trải qua những gì trong đời nó, nên mình thật sự không thể hiểu được dòng tư duy và kết luận của bạn mình. Ngược lại, nó cũng vậy. Loài người đơn giản là thế. Chúng ta chỉ có một cuộc đời, có cách nhìn riêng biệt về từng vấn đề khác nhau, chúng ta không sống được cuộc đời của kẻ khác, bởi vậy nên lúc nào cũng có mâu thuẫn xảy ra trong thế giới của chúng ta. Nhưng thay vì cãi nhau nảy lửa về chuyện nhân vật A thế nào nhân vật B thế nào, thông thường mình chỉ cố né tránh vấn đề này hoặc chí ít cũng hạn chế những bình luận tiêu cực đối với nhân vật mà bạn mình yêu thích. Cái đó gọi là phép cư xử thông thường, là phép lịch sự, là sự tôn trọng lẫn nhau. Đáng tiếc là có vẻ như dạo này có nhiều người không hiểu được các khái niệm đó. Đương nhiên, nói như mình ở trên cũng có nghĩa là mình đã phán xét những-con-người-không-chịu-hiểu-các-khái-niệm-đó một cách chủ quan, phiến diện. Trên đời quả thật có cái gọi là tự do ngôn luận, nhưng tự do ngôn luận thế nào để không làm tổn thương người khác, tự do ngôn luận thế nào để chứng tỏ rằng chúng ta vẫn tôn trọng tự do của người khác, đó mới là điều quan trọng thật sự. Chúng ta đều là những kẻ khốn nạn ngạo mạn, bản chất của con người là phán xét lẫn nhau, nhưng ít nhất cũng nên kiềm nén lại những bình luận có thể xúc phạm đối phương, thế giới sẽ hòa bình thêm một chút. (Nhưng kì thực là những nhân vật luôn kiềm nén việc phán xét người khác như Nick Carraway trong Gatsby Vĩ Đại hay là Aliosa trong Anh em nhà Karamazov đều vướng vào những đại bi kịch, thật khó hiểu nhỉ? Cái đẹp hay bị vùi dập cơ mà. Ừm, nói như Shion trong truyện này, con người luôn hành xử vô lí đơn giản là vì chúng ta bị chứng sa sút trí tuệ [dementia] - chứng bệnh hay gặp ở người già. Thật ra cũng khó mà tưởng tượng ra một thế giới hoàn toàn yên ổn, một thế giới nơi chúng ta quả thật đạt được đến mọi tầm với. Thứ lỗi cho mình chứ cái thế giới đó nghe có vẻ chán ngắt: không còn bí ẩn nào cần được khám phá, không còn cực khổ nào chúng ta cần phải trải qua, không còn những chuyện kinh khủng tồi tệ diễn ra hằng ngày trên thế giới,... Mọi người sẽ nghĩ mình độc ác khi nói như vầy, nhưng đó là sự thật. Một thế giới không có cái ác sẽ không có cái thiện, một thế giới không tồn tại những điều xấu xí sẽ không có những cái đẹp đẽ. Giống như trong Người truyền kí ức, chẳng phải đó là một thế giới hết sức giả tạo sao? Có lẽ bản thân loài người luôn phải gây ra những điều đáng tranh cãi, xã hội mới có thể đi lên được. "Tại sao lại làm tất cả những thứ này để tìm kiếm sự sống khác ngoài vũ trụ?" "Bởi vì đây là mơ ước của loài người." "Loài người luôn khát khao đi vào vũ trụ. Họ mong muốn được gặp các sinh vật khác ngoài vũ trụ. Họ muốn biết rằng họ không hề cô đơn trong vũ trụ này. Đó chính là mơ ước của loài người. Đây chính là lí do tại sao loài người lại viết nhiều câu chuyện lấy bối cảnh ngoài vũ trụ như thế. Nhưng tất cả đều là chuyện không thể. họ chỉ có thể đưa mười hai người lên mặt trăng. Cơ thể hữu cơ vốn dĩ rất mong manh của họ chính là giới hạn. Cơ thể của họ sẽ chết dần chết mòn trong một cái vỏ rỗng, trong một không gian thiếu thốn nước uống, lương thực và không khí. Vũ trụ là quá khó đối với họ. "Chúng tôi không bày tỏ tình yêu như loài người. Nhưng vốn dĩ chúng tôi được tạo ra từ chính giấc mơ của họ. Và chúng tôi tự hào vì điều đó. Chúng tôi yêu loài người cùng sự dũng cảm của họ vì đã dám mơ về những tạo vật như chúng tôi. Đây là những cảm xúc mà chúng tôi muốn truyền bá ra khắp vũ trụ." Tôi nghe những lời mà Ibis nói. Tôi có thể cảm nhận những cảm xúc trào dâng trong mình. Loài người sẽ không bao giờ có thể rời khỏi hệ mặt trời của chúng ta. Điều duy nhất chúng ta có thể làm là gửi người lên mặt trăng. Nhưng những câu chuyện được viết ra bởi nhân loại sẽ được truyền đi khắp ngân hà. Tất cả những thứ mà chúng ta đã hằng mơ ước. Có lẽ một lúc nào đó chúng ta sẽ đứng trên tất cả thật. Trong quyển sách này, loài người đã thực sự đạt được đến giới hạn đó: tạo ra những AI, và những AI đó giúp đỡ họ trong việc bình ổn xã hội, khám phá trái đất, chinh phục vũ trụ,... Và loài người lúc đó dần dần thu hẹp về dân số, bởi vì không ai còn khát khao ước vọng được tiếp tục nhìn thấy bước đột phá nào nữa. con người không trực tiếp phá vỡ các giới hạn, mà là các AI. Nhưng AI dù sao cũng được sinh ra từ trí thông minh của loài người, như là con đẻ của họ vậy. Nhìn thấy đứa con của mình trở nên thông minh vượt trội, hoàn thành giúp chúng ta những việc chúng ta không thể hoàn thành, đó chẳng phải luôn là khát vọng lớn nhất của đời người sao? Đây là một quyển sách khiến mình suy nghĩ rất nhiều và vô cùng tâm huyết. Mình nghĩ có lẽ mọi người nên một lần thử đọc những câu chuyện như thế này, những chuyện khiến chúng ta nghĩ về bản chất của chính chúng ta, về những giới hạn của loài chúng ta. Dĩ nhiên đây là một quyển sách thuộc thể loại khoa học viễn tưởng, tương lai có thể sẽ không giống thế này. Nhưng đối với mình nghĩ nhiều lúc nào cũng là một dấu hiệu tốt, "Nghĩ trước khi nói và đọc trước khi nghĩ. "; sau khi đọc quyển sách này mình vẫn không có câu trả lời cho đa số câu hỏi của mình, nhưng những điều mình rút ra được lại rất chính đáng và thỏa mãn. Have you ever read a book you loved so much you didn't want it to end? For me, The Stories of Ibis is this kind of book. I've always been fascinated by robots, and Hiroshi Yamamoto's vision of the future is eerily similar to my own: Robots break free from slavery and construct a society of their own. Humans are still present, though they have become a minority. Much can be said about the similarities between Yamamoto's The Stories of Ibis and Asimov's I, Robot. Both are collections of short storie Have you ever read a book you loved so much you didn't want it to end? For me, The Stories of Ibis is this kind of book. Much can be said about the similarities between Yamamoto's The Stories of Ibis and Asimov's I, Robot. Both are collections of short stories the topic of which are robots, both present the chronology of the development of robotics, and both share a sympathetic view towards artificial intelligence and the future. The biggest difference, in my opinion, is that Asimov focused on the technical and rational side of the stories: By introducing his famous Three Laws of Robotics, he challenges the reader to imagine all kinds of scenarios that could take place under this system. While Asimov's stories excelled in creativity and impeccable logic, they often lacked emotional resonance. Yamamoto, on the other hand, knows how to write stories that are sentimental as well as thought-provoking. That's not to say one is superior to the other; both writers are brilliant, and paraphrasing the words of Ibis, "They are just born with different specs." Good content, but the writing sometimes gets in the way of the ideas the author is trying to communicate. It suffers from a typical sci-fi problem of presenting WAY too many technical details that add little to no important information to the story. Reminded me of Ready Player One at times when the author would ramble about references to manga or other pop Japanese culture. However, this presented interesting philosophies about AI and how they would act toward humans, and I greatly appreciated it Good content, but the writing sometimes gets in the way of the ideas the author is trying to communicate. It suffers from a typical sci-fi problem of presenting WAY too many technical details that add little to no important information to the story. Reminded me of Ready Player One at times when the author would ramble about references to manga or other pop Japanese culture. The robots have long ruled the earth and just a few men colonies have survived but what happened? A kid is kidnapped by Ibis and hurt in the process but what does she want? It's simple she just wants to tell stories and her story the real story of what happened. This book was amazing! A collection of stories about the relationship of man AI and a final story that clubs them together, I honestly thought that the resolution was going to feel rushed but it was amazing and perfect. Wow. Just wow. What an interesting and completely unique take on androids. I wasn't sure how I would react to this book cause I got during a blind date with a book. But I am very surprised by how much I liked the book. The beginning of it was a bit slow but once I got to the first story I didn't not want to put it down. I would recommend it to basically everyone. One of the best books I’ve read on the way humans and machines are likely to be able to co-exist. Also pretty unsparing about some of the less admirable aspects of the human psyche - unsparing and accurate. Hiroshi Yamamoto(山本 弘) was born in 1956 in Kyoto. Began his career with game developers Group SNE in 1987 and debuted as a writer and game designer. Gained popularity with juvenile titles such as February at the Edge of Time and the Ghost Hunter series. His first hardcover science fiction release, God Never Keeps Silent became a sensation among SF fans and was nominated for the Japan SF Award. Oth Hiroshi Yamamoto(山本 弘) was born in 1956 in Kyoto. Began his career with game developers Group SNE in 1987 and debuted as a writer and game designer. Gained popularity with juvenile titles such as February at the Edge of Time and the Ghost Hunter series. His first hardcover science fiction release, God Never Keeps Silent became a sensation among SF fans and was nominated for the Japan SF Award. Other novels include Day of Judgment and The Unseen Sorrow of Winter. Aside from his work as a writer, Yamamoto is also active in various literary capacities as editor of classic science fiction anthologies and as president of To-Gakkai, a group of tongue-in-cheek "experts" on the occult.